The Conquerors are leaders in providing Motivational, Inspirational, Age-Appropriate School Assemblies for grades K-12. In a day when superior athletes and unbelievable strength are a major part of the American culture, it is understandable that when an audience sees strong men and women perform amazing feats of strength it brings them to their feet! These feats, combined with upbeat music and a relevant, inspirational message, make a "strong" impression on students. The presentations are the perfect mix of intensity and humor, allowing students to have fun as they open their hearts to a powerful message of hope. Team members will share real stories from their own lives which address: overcoming discouragement, poor choices, fear and failures - the same obstacles facing youth today. With over a decade of experience, The Conquerors are leaders in motivational and inspirational school assemblies and are dedicated to provide the most effective assemblies worldwide. We are a team of world-class athletes with a world-class message to help guide students to make decisions for a successful future. By using feats of strength with student participation, humor and a highly motivational message, The Conquerors are able to capture the attention of students and inspire them to new levels of achievement. We share not only the physical result of what happens when students apply their potential for success, but also the emotional tools it takes to become a champion at life. The Conquerors are motivating youth to a new level of achievement using a highly impacting and timely message that has lasting results. Many times The Conquerors hold events hosted by a group of churches in a community or a ministerial association. With a neutral venue of an auditorium, gymnasium or civic center, your city can be impacted for Christ. 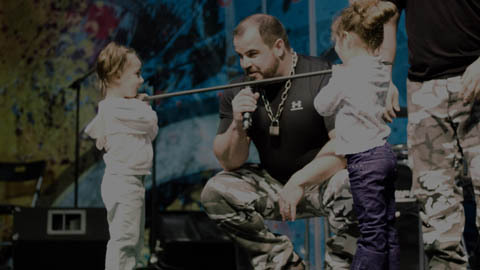 The Conquerors International Strength Team uses feats of strength in a high-energy presentation to reach audiences of all ages with the Gospel of Jesus Christ. A Conqueror’s Community Outreach Event will ignite a passion for outreach among your congregation! “How can I effectively reach my community?” This is the question that thousands of pastors ask themselves every day. The good news is that you can reach your city and have your church as the point of impact in your area. When you utilize The Conquerors, you are holding a Community Outreach Event that is proven to reach the masses. Is a non-denominational, para-church ministry with accountability and covering from Resurrection Life Church International, headquartered in Grandville, Michigan. Is dedicated to bringing the uncompromised Gospel of Jesus Christ in a relevant and dynamic way. Is a drug-free ministry with a zero-tolerance policy toward any performance-enhancing drug. The Conquerors have worked with schools and churches of every denomination and background and have numerous recommendations from Pastors and administrators. The Conquerors are partnered with other world class ministries that enable us to effectively reach every area of a community.